Author(s): Nelson Durán, Institute of Chemistry, Biological Chemistry Laboratory, University of Campinas, CP 6154, Campinas, CEP 13083970, SP, Brazil. Diego Stéfani T. Martinez, Camila P. Silveira, Marcela Durán, Ana C.M. de Moraes, Mateus B. Simões, Oswaldo L. Alves, Wagner J. Fávaro. During the last ten years, graphene oxide has been explored in many applications due to its remarkable electroconductivity, thermal properties and mobility of charge carriers, among other properties. As discussed in this review, the literature suggests that a total characterization of graphene oxide must be conducted because oxidation debris (synthesis impurities) present in the graphene oxides could act as a graphene oxide surfactant, stabilizing aqueous dispersions. It is also important to note that the structure models of graphene oxide need to be revisited because of significant implications for its chemical composition and its direct covalent functionalization. Another aspect that is discussed is the need to consider graphene oxide surface chemistry. The hemolysis assay is recommended as a reliable test for the preliminary assessment of graphene oxide toxicity, biocompatibility and cell membrane interaction. More recently, graphene oxide has been extensively explored for drug delivery applications. An important increase in research efforts in this emerging field is clearly represented by the hundreds of related publications per year, including some reviews. Many studies have been performed to explore the graphene oxide properties that enable it to deliver more than one activity simultaneously and to combine multidrug systems with photothermal therapy, indicating that graphene oxide is an attractive tool to overcome hurdles in cancer therapies. Some strategic aspects of the application of these materials in cancer treatment are also discussed. In vitro studies have indicated that graphene oxide can also promote stem cell adhesion, growth and differentiation, and this review discusses the recent and pertinent findings regarding graphene oxide as a valuable nanomaterial for stem cell research in medicine. The protein corona is a key concept in nanomedicine and nanotoxicology because it provides a biomolecular identity for nanomaterials in a biological environment. Understanding protein corona-nanomaterial interactions and their influence on cellular responses is a challenging task at the nanobiointerface. New aspects and developments in this area are discussed. Keywords: Nanocarrier, Graphene oxide, Doxorubicin, Stem cells, Protein corona. Affiliation:Institute of Chemistry, Biological Chemistry Laboratory, University of Campinas, CP 6154, Campinas, CEP 13083970, SP, Brazil. Keywords:Nanocarrier, Graphene oxide, Doxorubicin, Stem cells, Protein corona. 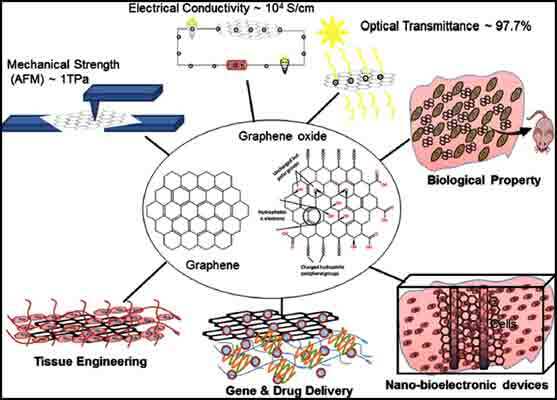 Abstract:During the last ten years, graphene oxide has been explored in many applications due to its remarkable electroconductivity, thermal properties and mobility of charge carriers, among other properties. As discussed in this review, the literature suggests that a total characterization of graphene oxide must be conducted because oxidation debris (synthesis impurities) present in the graphene oxides could act as a graphene oxide surfactant, stabilizing aqueous dispersions. It is also important to note that the structure models of graphene oxide need to be revisited because of significant implications for its chemical composition and its direct covalent functionalization. Another aspect that is discussed is the need to consider graphene oxide surface chemistry. The hemolysis assay is recommended as a reliable test for the preliminary assessment of graphene oxide toxicity, biocompatibility and cell membrane interaction. More recently, graphene oxide has been extensively explored for drug delivery applications. An important increase in research efforts in this emerging field is clearly represented by the hundreds of related publications per year, including some reviews. Many studies have been performed to explore the graphene oxide properties that enable it to deliver more than one activity simultaneously and to combine multidrug systems with photothermal therapy, indicating that graphene oxide is an attractive tool to overcome hurdles in cancer therapies. Some strategic aspects of the application of these materials in cancer treatment are also discussed. In vitro studies have indicated that graphene oxide can also promote stem cell adhesion, growth and differentiation, and this review discusses the recent and pertinent findings regarding graphene oxide as a valuable nanomaterial for stem cell research in medicine. The protein corona is a key concept in nanomedicine and nanotoxicology because it provides a biomolecular identity for nanomaterials in a biological environment. Understanding protein corona-nanomaterial interactions and their influence on cellular responses is a challenging task at the nanobiointerface. New aspects and developments in this area are discussed. Circulating Tumor Cells in Cancer Therapy: Are we off Target?